The Normans wanted to create a home that would remind them of being on holiday. Their 1960s chalet in Rickmansworth, Hertfordshire, has been transformed over the years into a modern family home, and their latest project has been to build a garden room with a Spanish feel. At the Grand Designs Show in London, the Normans met Origin, a UK specialist manufacturer of bespoke aluminium folding sliding doors and were impressed with the versatility of bi-folding doors. 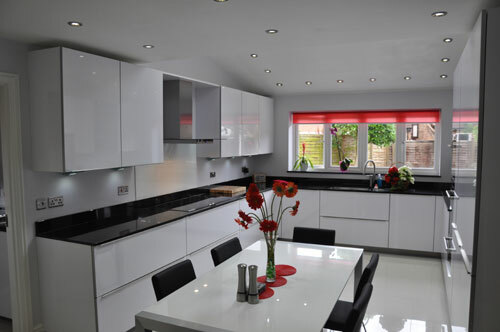 For them the key points – bespoke design, fast lead times, security and variety – proved to be the ideal solution for their extension. “In terms of quality, we wanted the best; the fact that Origin doors are entirely UK manufactured is great. We visited the factory and showroom in High Wycombe and were convinced that they could supply the doors we wanted for our extension,” says Julia Norman. Inspired by the modern architecture of their home in Spain, they wanted a room that reminded them of being on holiday so they commissioned Origin to design their bi-fold doors for their 7.5m by 3.6m extension. Design aspects such as crema marfil marble tiles, cream stone walls and inward opening windows, were dictated by the Normans in the extension design. They specified a five door set-up all folding and sliding in the same direction and a separate three door set-up, to create as much open space as possible. The bi-folding doors are energy-saving, with superior thermal efficiency as well as tinted and self-cleaning smart glass. The material used for the bi-folds is high grade aluminium allowing for a narrow, more aesthetically pleasing frame. The realistic wood grain effect of the doors fits with the design of the house and the existing window frames which were important factors for the Normans. The doors pictured are in Origin’s newest wood grain effect colour, Walnut. The 264sq ft extension has transformed the house, creating the garden room they always wanted. Julia elaborates: “The whole structure of the garden room is perfect, the living area has an open plan feel so we can enjoy the garden, it also serves as an ideal entertaining space. We love the infinity of light that seems to pour in throughout the day – it reminds us of our holiday home in Spain. Family entertaining is very important to the Normans. They often have big family holidays in Spain and wanted to bring that feeling of warmth and light back to their Rickmansworth home. 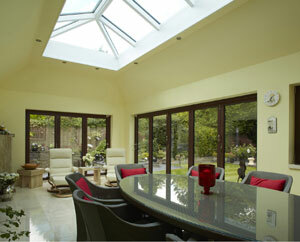 This wonderful bi-fold extension has created the ultimate indoor/outdoor living area for the whole family to enjoy. “One of the super things about Origin bi-folding doors is that they are ‘finger safe’, my daughter has recently had a baby, and important features like ‘finger safe’ gaskets are so important,” adds Julia. The gaskets Origin uses between each door leaf are specially made to protect inquisitive little fingers. After two years in the planning, the Normans’ house certainly has the ‘wow’ factor. 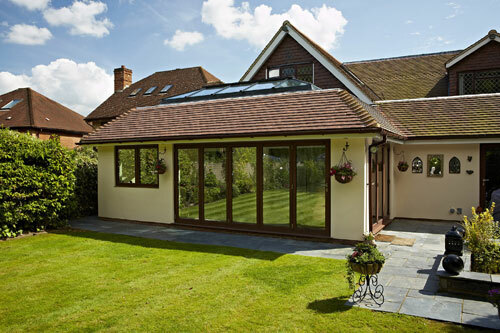 As soon as you walk into their home, the light steaming through the 4185 x 2070mm five set and 2525 x 2080mm three bi-fold set immediately draws you towards their open-plan garden room. Few people mourn the passing of the 70s bathroom suites with those lovely deep alpine blue and avocado colours. Thankfully time has moved on and I would hope that many of those suites have now been replaced. I’m sure most people are glad that white is now universally used for sanitary ware but that doesn’t mean that bathrooms have to be dull and lacking in colour or sparkle. When considering what to do with my own bathroom suites, and in particular for my ensuite, I decided to be adventurous with the design and opt for black walls and floors. A rather dramatic choice perhaps – but it really works. Even my bathroom installer was highly dubious about my colour choice thinking it simply wouldn’t look right. 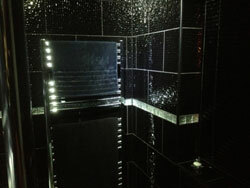 Having researched black smooth tiles I actually went a step further and selected wall tiles with a dimpled texture. I knew that this texture would allow the light to bounce off them, which in turn creates a wonderful illusion of space. Next, I decided to go for an ice block border which really makes the black tiles pop, and then added gloss black floor tiles which again reflect the light and actually make the room look bigger. The moral of the story is to remain true to the vision you have about decoration. Be bold and use your imagination when designing rooms and especially when playing around with colours for your bathroom. I’m now in the process of redesigning my other bathroom and because I am so impressed with the dimpled and glossy tiles I have used, I have decided to flip the colour theme on its head and have the same tiles in white this time. Keep an eye on this blog for that story to follow! 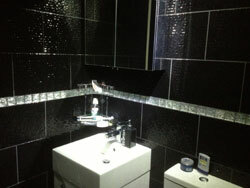 Take a look at these images of the finished en-suite to see what you think. Many people avoid painting the internal walls in their house brilliant white. I for one love it. White walls can be stark and bare but they enable two very flexible opportunities for interior design. Firstly you can change your theme colours regularly such as cushions, curtains, rugs and pictures – this means if you get fed up with how a space or room looks, it’s not a job for a decorator, it’s a very exciting shopping expedition to find lovely new gorgeous furnishings! Secondly and this is perhaps something you can’t control as much but white walls do make a room look bigger, if that is what you are aiming for. Even in larger spaces white walls become even more impressive. There is nothing that doesn’t coordinate with white, which gives you total flexibility with your colour schemes throughout the house. Much as I love colour, I have never found it easy to choose a wall paint or paper which achieves what I hoped in my mind’s eye. Paint colours in particular are very hard to choose and even when the pot is opened there is no guarantee the colour is exactly what you imagined. Times have moved on however with colour matching services and tester pots I would recommend are essential before committing to buying the paint for the whole area. Then of course we have the feature wall which can contrast wonderfully with white walls but can also have dramatic effect on a room – both good and bad! In my view you have to be very careful not to choose something with a large pattern if the feature wall space is small or for that matter not too bright. However my caveat here is that there is definitely room for individual taste and boldness with regard the overall desired effect you might want to achieve for the wall. I love the fact that, there are so many wonderful wallpapers out there now which are incredibly innovative and can be custom made. 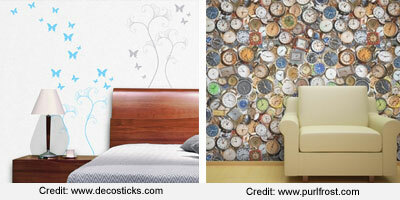 The other option which is perhaps less permanent, is to attach decals or wall stickers. Some of these can be patterned, famous quotes or smaller images which you can stick to the wall to provide an effect. Most of these can be removed relatively easily if you want to change or update the design. Whatever colours and designs you select – your personal taste will always win through and if that works for you – then it’s absolutely the right choice! It started off with a decision to replace the windows in the lounge and dining room. This was the final stage of a project to replace all the windows of our 1970s bungalow with more energy efficient ones. Having been happy with the work done previously on other rooms, we called back the same window company for a quote. The technician explained that in order to remove the existing windows, the teak cladding on the lounge chimney breast would need to be taken off. Immediately, the scale of the redecorating job ahead of us was ramped up. We had never been keen on this dated cladding, or on the fireplace that we inherited when we bought the home, so it was time to bite the bullet and throw the lot out. Rather than replace the fireplace with something more attractive, we decided to block up the chimney, cutting a potential draught source and aiding the never-ending battle against rising heating bills. But like many people, we still wanted a fire as a focal point. So began the search for a hang-on-the-wall electric version. My husband saw a reasonably-priced one at a local fireplace centre and I duly went along to look – only to dismiss it straight away as far too small for our large living room. On a tour round the rest of the shop, we found one that we both liked and was much better proportioned – but of course it was three times as much as the one we first viewed! We went away to spend hours trawling the internet and visiting DIY stores to look at more fires, but eventually came back to the swish but pricey model we had already seen. We had been won over by the slim dimensions and the attractive Corian® surround, which we knew would be hard-wearing. But there were still choices to be made – brick or reed background? Brick. Log effect or pebbles? Logs. (Why have pebbles suddenly become trendy – who burns pebbles?) Then the colours or stone look options. Does anyone really need a mind-boggling choice of 100 colours? Having placed our order, we needed to make sure we had exact measurements and knowledge of the position of the connections so that the cable trunking could be precisely placed before the now-naked chimney breast was re-plastered. Fast forward a few weeks and the job is finished. A cosy living area with new windows, wallpaper, wall lights, carpet (needed after removing the hearth) and cushions. 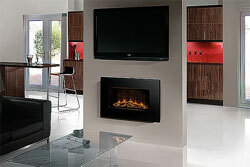 The fire flickers, emphasising the warm glow we feel.